We keep hearing that video is on the rise as a key digital marketing tactic, but research shows its has surpassed “up-and-coming.” Video is an effective and powerful way to connect with prospects and the demand for video over other media continues to increase. According to HubSpot, 4 times as many customers would rather watch a video about a product than read about it. This is not something financial advisors can ignore and it’s important now more than ever to understand how to best share your videos. No one ever says, ‘I want to work with you because of your video.’ But it gives people a higher comfort level, because it gives them a sense of the planner. There’s no doubt that YouTube rules the online video world with over a billion users. 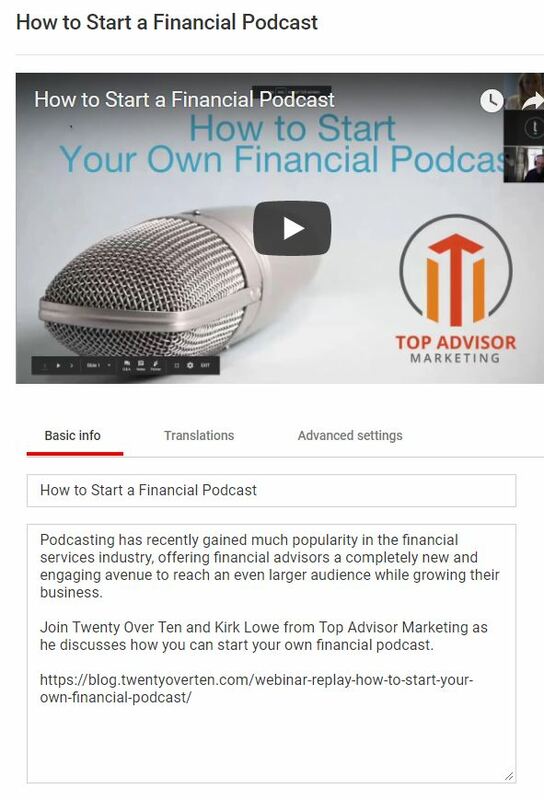 First and foremost it’s important to understand the purpose of YouTube for financial advisors. Prospects who are searching for videos on YouTube are likely not there to learn about your brand specifically. They are there to find value in the information that they are seeking. Twenty Over Ten client and founder of Forward Thinking Wealth Management, Dan Johnson answers frequently asked questions, as well as highly searched topics to better connect with prospective clients. Transparency is everything in the financial services industry and what better way to do that then to give users a glimpse into your office’s life? Not only do they learn more about your firm and work, but it gives your brand a personality and relatable human characteristics that attract clients and prospects. 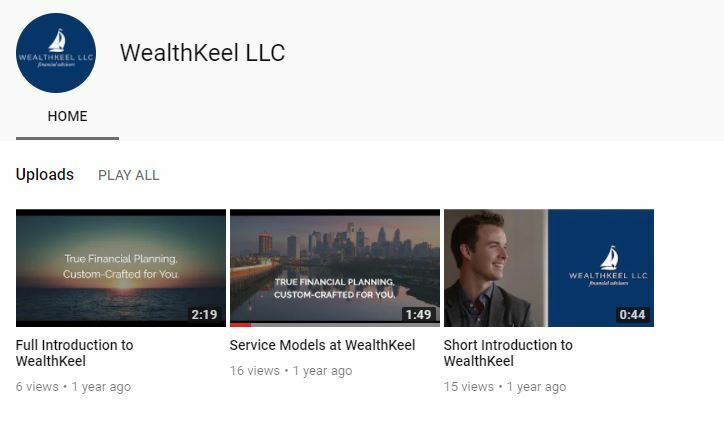 Our friends at Vyral Marketing have created a “You’re Invited” welcome video for prospects who land on their YouTube page. Maybe you provide free consultations for prospects or have offered free seminars in your local community. Why not translate those teachings into a video format? Your knowledge can live on YouTube, become a source of information for prospects and clients alike, and show your expertise in the industry. By producing these videos that feature your skills, you can build trust with viewers who are in need of financial services. As an advisor, it’s likely you offer your clients access to a portal. Consider creating a video using a screen share to review the client portal you’ve chosen to use for your practice. You can discuss how clients can access it, login, navigate their account, analyze reports, and more. 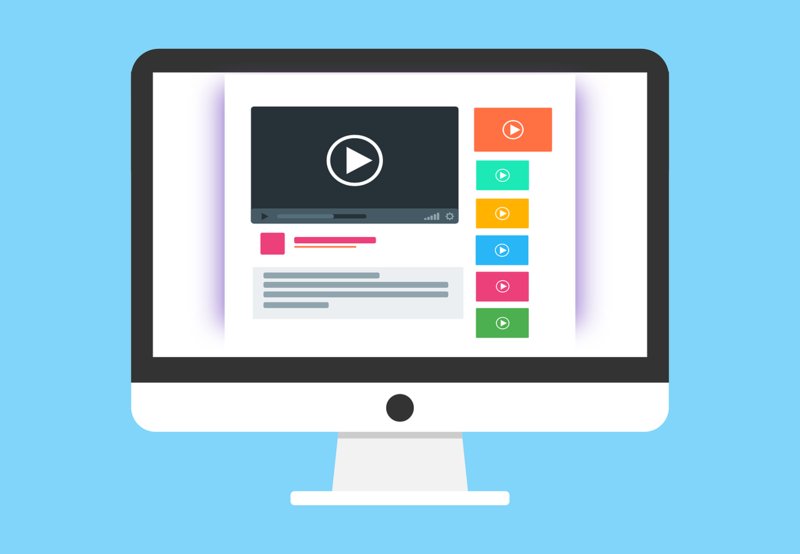 Okay, so now that you’ve got some great content how can you ensure users find your videos on a crowded platform like YouTube? Today we’re sharing our seven top tips to help optimize your YouTube videos for better ranking. Believe it or not, optimizing your YouTube channel and videos begins with how you name your video file on your computer before uploading it. Video file names are considered an “invisible” ranking signal for YouTube, so be sure to name your video file appropriately. Use a simple but descriptive title that summarizes your video. If possible, use relevant keywords, as they help YouTube better categorize the content. On the backend of Twenty Over Ten’s YouTube page, you can see our original video file title is noted under “Raw File.” We used a title that appropriately described our video to increase our YouTube ranking. Your video’s title should be a few short words – max of 60 characters. Similar to the file name, titles should be descriptive and summarize the video in a captivating way. Again, be sure to include the keywords you’re hoping to rank for. 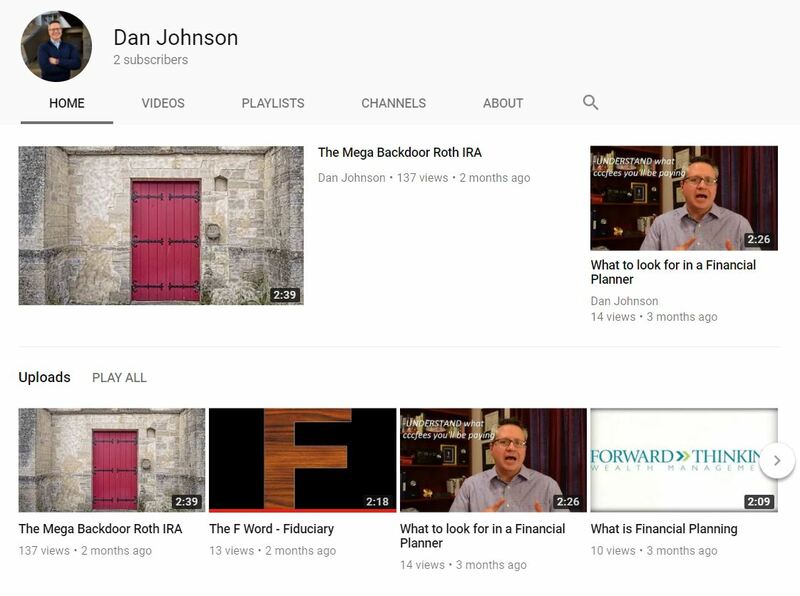 Dan Johnson at Forward Thinking Wealth Management uses titles that intrigue prospects, as well as boost his YouTube and Google rankings. Tags help YouTube associate your video with text and ultimately connect searchers with your video. However, this doesn’t mean you should go crazy with tagging! If you abuse the tag feature, it will hurt your ranking. You should only use relevant tags and 6-8 tags are thought to be the ideal amount for each video. When picking tags for your videos we recommend check YouTube’s most popular tags to find trending topics. Aligning both your video content and tags to those top tags can boost your ranking and better connect you with prospects. Uploading a written version of your video only helps YouTube better identify the content in your video. This will increase your chances of showing up in relevant searches and connecting with more prospects. Remember, as a financial advisor, your video marketing will also need to be approved by compliance. To play it safe, you can always write your video script and share it with your compliance team for approval prior to filming. Thumbnails are the picture viewers see before they click to watch your video. They are one of the first things users see when searching on YouTube and can often determine if the user will click to watch or not. YouTube will auto generate thumbnails for you from throughout your video that you can choose from but you may also create your own and upload it. If you go with the second option, you may want to add text over an image to further entice prospects to watch your video. Whatever you choose to do, your thumbnail should be clear and relevant to the content of your video but somewhat intriguing to encourage views. Your video descriptions are unlike the file name in the sense that they are “visible” ranking signals for YouTube. You have roughly 5000 characters to play with in a YouTube video description. However, only the first 100 characters or so will be visible to users as they land on your page so use them wisely. Consider who you are targeting, what they are looking for, and how you can attract them. Additionally, this is a great place to link back to your website, blog, and landing page for even further reach. Lastly, getting people to share your videos and subscribe to your YouTube channel can make a huge impact on your overall online presence. This is an indicator to YouTube and Google that you and your video content are authoritative, which increases your chances of ranking higher. 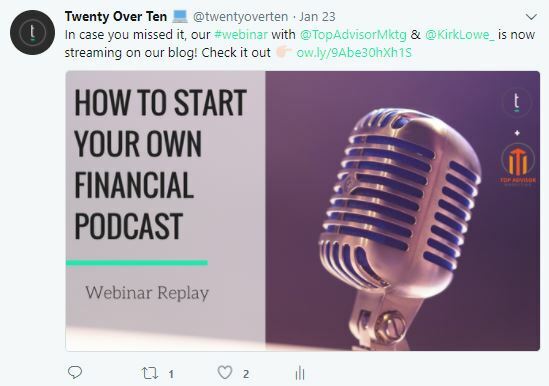 We share a recent webinar replay on the Twenty Over Ten Twitter page. To attract more shares and subscribers, always share your published YouTube video links on your social media channels and blog. You can also consider asking clients and prospects to subscribe to your YouTube channel for tips, tutorials, workshops, and announcements via a newsletter. Lastly, produce great content that makes viewers want to utilize your video and share it with others. Subscribe to the Twenty Over Ten YouTube channel to get access to free webinars, tutorials, and more!